It’s been almost a year since I’ve updated the list of my 20 Favorite Airline Awards. Since then, so much has changed in the world of points and frequent flyer miles—from Aeroplan fuel surcharges to British Airways’ new Avios program—that I thought it was high time for a refreshing of the list. I’m going to go on my own experiences booking trips using points and miles, as well as those of many readers. This is by no means an exhaustive list, just some of the best “bang for your mile” redemptions. Have a good redemption you don’t see below? Tell me about it in the comments! 2) 4,500 British Airways Avios points for one-way short-haul (650 miles or less) economy flights. British Airways is a 1:1 transfer partner of both Chase Ultimate Rewards, American Express Membership Rewards and Starwood Preferred Guest. 3) 63,000 ANA miles for roundtrip New York to London on Virgin Atlantic Upper Class (business class). Note: ANA is a 1:1 transfer partner for American Express Membership Rewards and Starwood Preferred Guest. 4) 150,000 Delta SkyMiles for roundtrip US to Australia, including on partner V Australia. Delta will also let you route via Hawaii (on partner Hawaiian airlines) or via Tahiti using Air France/Air Tahiti Nui. Note: V Australia flights do have ~$500 surcharges. Coach for these same itineraries is 100,000 miles. Delta is an Amex and Starwood Preferred Guest transfer partner. 5) 68,000 ANA miles for roundtrip East Coast to Europe with stopovers. I once booked a great trip to Germany for Oktoberfest: JFK-Frankfurt-Munich (stop), Munich-Berlin (stop), Berlin-Frankfurt-JFK. JFK-FRA was on Singapore airlines on their 747 upper deck and all other legs on Lufthansa. Taxes were a bit high at $400, but it was worth it. ANA is an American Express and Starwood transfer partner. 6) 120,000 Delta Skymiles for roundtrip business class to Africa (excluding South Africa), including Mauritius and Reunion. You can also include a stopover and an open jaw, which comes in handy when routing via Europe. Delta is partners with Kenyan Airways, KLM and Air France, which provide a good number of opportunities for African travel. 7) 40,000 mile American roundtrip off-peak coach to Europe between October 15-May 15. Tip: for Europe awards American classifies Hawaii in the same region as the continental US, so you can actually fly Hawaii to Chicago, Dallas, Miami or New York and build in a stopover before continuing onto Europe. Offpeak awards can also be used on Oneworld partners; like British Airways, Iberia, and Finn Air. American is a Starwood Preferred Guest transfer partner. 8 ) 60,000 mile US Airways roundtrip off-peak business class awards to Europe. Only on US Airways flights, January 15- February 28. 9) 120,000 Continental/United miles roundtrip business class o South Africa- and you can even route via Brazil (South African has great availability on Sao Paulo to JNB) and United allows a stopover on awards. United is a 1:1 Ultimate Rewards transfer partner and 2:1 Starwood transfer partner. 10) Southwest yearly companion pass. While not necessarily an award, you earn it after 100 one-way flights or 110,000 Companion Pass Qualifying points (currently their 50,000 point credit card sign-ups do count). Once you get the companion pass, it can be good for nearly 2 years of unlimited companion flying. Check this post for more details. Southwest is a 1:1 transfer partner of Chase Ultimate Rewards, but transferred points do not qualify for the companion pass. 11) Flying Blue 50,000 mile roundtrip North America to Europe in business class promo award. The cities change every two months, but I recently flew Air Europa from Madrid to Miami in business class for 25,000 miles one-way (transferred from Amex Membership Rewards) and ~$100 in fees. Tip: Flying Blue classifies Tel Aviv as a part of Europe, so these promo awards apply to Tel Aviv travel as well. 12) 24,000 Lan kilometers for roundtrip coach travel within Chile, Argentina and Uruguay. Even short intra-South American flights can be very expensive, so these redemptions can be lifesavers. Plus, Starwood points transfer at a generous 1:2 ratio, so with their 25% bonus it means 20,000 Starwood points = 50,000 Lan Kilometers. There is currently a 25,000 point sign-up bonus on the Starwood Amex which equates to 60,000 Lan kilometers! 13) 140,000 Alaska miles for roundtrip US to South Africa via Hong Kong in Cathay Pacific First Class (which is one of the best First Class cabins in the sky). You can even build in a stopover in Hong Kong. Alaska is a transfer partner of Starwood. 14) British Airways Travel Together awards. If you spend $30,000 on the BA Visa within a calendar year you get a free companion on an award redemption. So you get two tickets for the price of one (plus taxes/fees on the second). So New York to London in business class is 80,000 miles roundtrip plus $700 in fees. With the pass you could get two tickets for 80,000 miles and $1,400. A hefty cash outlay, but not bad since BA has a great business and first class product and great award availability. More info here. 15) 125,000 Aeroplan miles for roundtrip US to Asia in business class. The real value here lies in the routing- Aeroplan will let you cross the Atlantic or Pacific to go to Asia so you can effectively build a “round the world” itinerary with 2 stops. So for example, Chicago-Zurich (stop)- Singapore (destination)- Tokyo (Stop)- Chicago. 16) 25000 mile + £170 copay bmi coach roundtrip awards North America to Europe. 17) 37, 500 mile + £255 copay bmi business class roundtrip awards North America to Europe. 18) Intra-Asia awards on Continental/United. With so many Asian Star Alliance carriers (Like Singapore, ANA, Air China, Asiana, and Thai) there are a ton of options. For example, one way intra-Japan flights, which can get expensive on certain routes, are only 6,000 miles. Japan to North Asia (China, South Korea, Taiwan and Mongolia) is only 10,000 miles one way coach. China is a huge country, so think of the possibilities. 19) 100 credit Airtran yearly companion pass. While they don’t give it to you like Southwest, you can redeem Airtran credits to get this pass, which gives unlimited companion flights for a year. The last day to transfer Amex Membership Rewards to Airtran is February 29, 2012 and they transfer at 1,500 Amex = 1 credit or 150,000 Amex for the pass. 20) 280,000 Delta miles for a business class Round the World trip, with up to 6 stopovers. 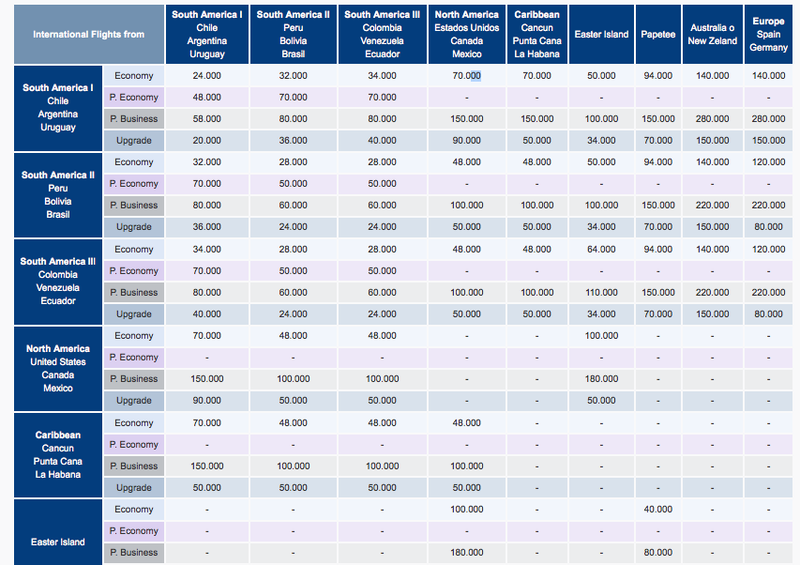 Since Skyteam partner availability is decent, planning these isn’t as hard as you’d think. And with frequent Amex transfer bonuses of up to 67%, those with Amex points can get this award for a mere 168,000 points.